ALLOWHITE 2B powder Brightener 24 100% Cotton - suitable for application with H2O2 bleaching. Neutral to bluish white shade. Paper & pulp-good for size press & coating. 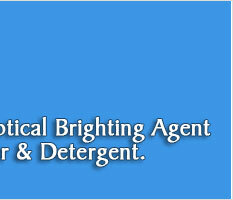 ALLOWHITE 2BA powder Brightener 24 50% Cotton - suitable for application with H2O2 bleaching. Neutral to bluish white shade. Paper & pulp-good for size press & coating. ALLOWHITE 2BF liquid Brightener 24 100% Cotton - suitable for application with H2O2 bleaching. Neutral to bluish white shade. Paper & pulp-good for size press & coating. ALLOWHITE Sl Liquid Brightener 220 100% Cotton - suitable for application with H2O2 bleaching. Neutral to bluish white shade. Paper & pulp-good for size press & coating. ALLOWHITE TG Liquid Brightener 253/113 100% Cotton - suitable for application with H2O2 bleaching. Paper & pulp-good for size press & coating. Pink tone with tint colour. ALLOWHITE WHN Powder Brightener 253 100% Cotton - suitable for co-application with H2O2 bleaching. Bluish violet to neutral white shade. Paper & pup-good for addition in mass. Also suitable for polyamides 68,66, wool and silk. ALLOWHITE 4BM CONC Powder Brightener 28 300% An excellent optical whitening Agent for detergent industry. ALLOWHITE BVN Powder Brightener 1 100% Cotton - suitable for application with H2O2 bleaching. Reddish violet to neutral violet shade. Paper & pulp-good for size press & coating. 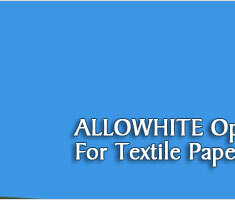 ALLOWHITE SGP Crude 113 550 E Value 90 +/- 3% Natural to Bluish Most Suitable for Waste Paper gives excellent brightness in natural size condition. Suitable for Wet end. ALLOWHITE TG Liquid 113 137.5 E Value 22% +/- 0.8% Natural to Bluish Most Suitable for Waste Paper gives excellent brightness in natural size condition. Suitable for Wet end and coating. ALLOWHITE PWA Liquid 113 100 E Value 16% +/- 0.8% Natural to Bluish Most Suitable for Waste Paper gives excellent brightness in natural size condition. Suitable for Wet end and coating. ALLOWHITE BBU Crude 220 440 E Value 78.2 +/- 2.5 Bluish White Wet end and Coating. Suitable For Bamboo and Wood. Suitable For acidic size, And Hard Water.